Instructions: Go outside after dark, look up high in the east, and find a big square of stars surrounding a whole lot of nuthin’. That’s the Great Square of Pegasus. If it doesn’t jump out at you, punch it up in Stellarium, print out a free sky map, or follow the other middle leg of the Cassiopeia W, the one that doesn’t point to the Double Cluster. 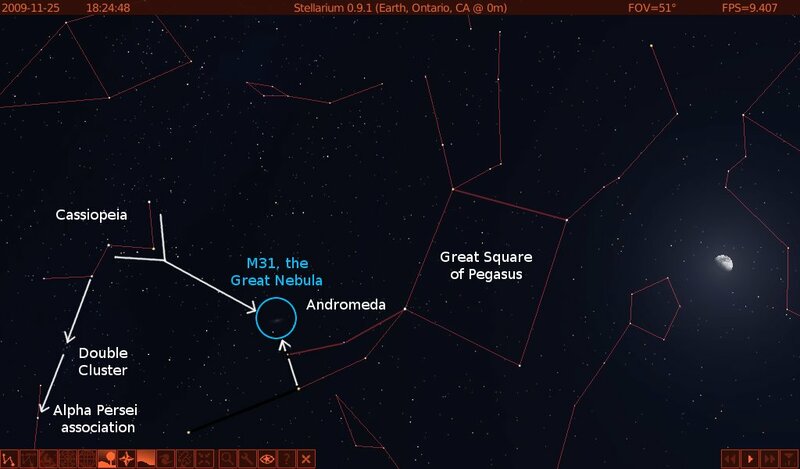 The Great Square of Pegasus isn’t all in Pegasus; the star at the northeast corner actually belongs to the neighboring constellation of Andromeda. But the square is such a handy signpost that most people ignore the official constellation boundaries as set out by the International Astronomical Union. That northeast corner star is the anchor for two almost identical chains of stars, one of which looks like a fainter copy of the other. Go from the second star in the brighter chain to the second star in the dimmer one, and then on in the same direction for an equal distance, and you’ll come to M31, the Great Nebula in Andromeda. 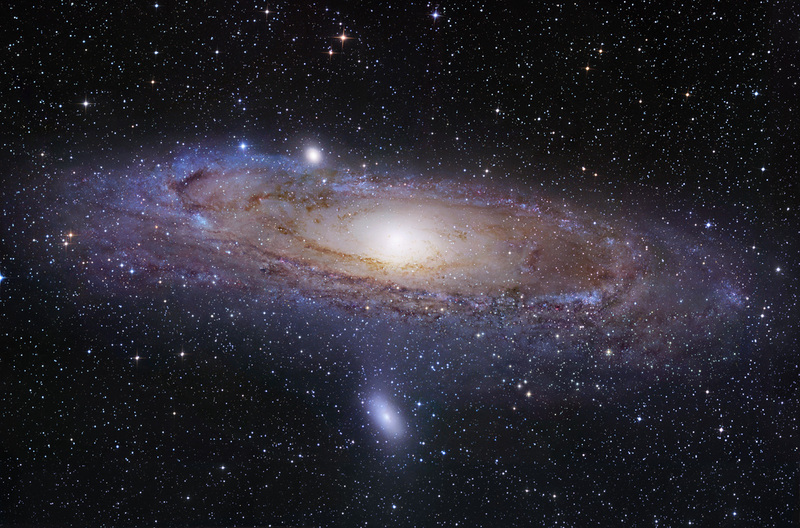 M31 was named Back In The Day when the term “nebula” was used for any hazy patch in the sky. These days “nebula” means an interstellar cloud of gas and dust, any one of the many that litter the arms of spiral galaxies. They come in lots of flavors, which I won’t cover here; the important thing is that nebulae are comparatively tiny parts of galaxies. M31, or the Andromeda Galaxy, is not just a galaxy; for stargazers in the northern hemisphere, it’s THE galaxy. From a dark site you can see it with the naked eye, and in fact at two million light years away, it is the most distant object that can be easily observed without optical aid (I qualified that with “easily” because there are a handful of more distant galaxies that can also be seen with the Mark 1 eyeball; pick up the current issue of Astronomy magazine and check out Stephen O’Meara’s column to learn more). In binoculars, the Andromeda Galaxy looks like a pretty oval haze with a bright core. As you go from binoculars to small telescope to big telescopes, the amount of visible detail increases but the field of view usually decreases, and it can be hard or impossible to fit the whole thing into the field of view of a long focal-length telescope. Think of that, a galaxy so big and so close you can’t see it all with most scopes! It’s so close that people with monster Dobs regularly amuse themselves by picking out its globular clusters, whereas small-scope folks like me find the globs in our own galaxy to be plenty challenging. The very, very small version of Rob Gendlers' very, very large M31 mosaic. If you want to see M31 in all its glory, you must get over to Rob Gendler’s site and check out the stupendously huge mosaics on his galaxies page. One of his images has a resolution of 21,904 x 14,454 pixels and at least as of 2009 was the highest resolution image ever made of a spiral galaxy, period. You may also know that the Andromeda Galaxy is destined to collide with our own Milky Way in a few billion years, setting off massive bouts of star formation as the two repeatedly pass through each other and eventually merge into something bigger and stranger, probably an elliptical but possibly a super-spiral or even a ring galaxy. Should be a pretty good show for whoever is around to see it. Don’t wait up though. M31 is high overhead in the early evening and pretty good viewing until the wee hours. Go check it out. You are currently browsing the 10 Minute Astronomy blog archives for the day Monday, December 7th, 2009.